The day began as another drizzly foggy day but at least it was warm. Arthur had a phone conference meeting in the morning and I did an interval running workout along the shore of downtown Cheticamp. 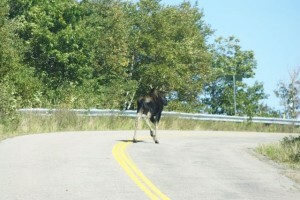 Then a leisurely 6 hour afternoon drive along the Cabot Trail where we encountered our 2nd moose of the trip. A young buck this time who lead a parade of 3 cars up a hilly slope of northwest Cape Breton National Park. 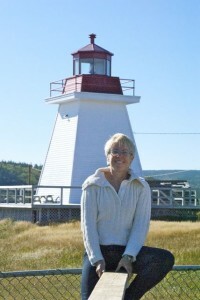 The weather soon cleared and we had a lovely lunch at Chowderhouse Restaurant at Neil’s Harbour lighthouse; delicious fresh lobster wraps and bowls of chunky seafood chowder. So good. We arrived at Sydney, NS for an evening of down time before tomorrow’s morning school show and the start of an 8 show week.